The project was a total kitchen refurbishment for a traditional Portuguese villa, built in 2008. The previous kitchen was a standard developers’ kitchen, which, eight years on, had seen better days. The homeowners wanted a new kitchen with plenty of good usable storage and worksurface. Besides being a practical space, they wanted an impressive entertaining/family area for family, friends and their two Portuguese water dogs – Harry and Rosie. The style was to be a blend of traditional and contemporary flavours. I worked closely with the family to achieve a design that suited the clients’ requirements both in terms of style and content. The design therefore blends traditional painted in-frame cabinetry, embodying a moulded Shaker door with contemporary accents in the form of shotblasted natural oak. A large island complements the wall-mounted cabinetry with additional cupboard storage and worktop space. The island also provides an informal dining/breakfast bar; ideal for entertaining whilst acting as a visual divide between the food preparation and social area of the kitchen space. The light tones of the French Grey furniture, combined with 20mm Dekton Edora worktops and clever lighting combine to make a bright, light space. Wonderful bespoke touches, that we have come to expect from Edwin Loxley, extend to the dogs’ feeding bowls; each bowl fashioned out of the same oak and inscribed with the dogs’ names. Traditional cabinetry was fused with contemporary touches such as the heavily grained shotblasted oak to create a contrast of both style and finishes. The light tones of the paint finish and the worktops, in a plain profile, give the room a light and airy feel. High specification integrated appliances such as the twin Neff ovens and Fhiaba fridge-freezer give the homeowners more than enough cooking and food storage capacity to cater for dinner parties and day to day family life. 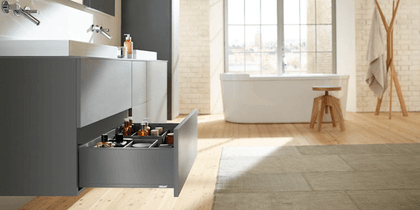 The Miele wine cooler is conveniently located beneath the island; adjacent to the seating. The quality and durability of the Edwin Loxley cabinetry means that it will last for years to come, with little, if anything, required by way of maintenance. The furniture can, in the future, be updated (should the homeowners wish) with a new paint shade and accessories to give a different look. The old worn out kitchen required removal and the flooring needed to match the adjacent sun lounge to give a design flow and feel of continuity. ‘The devil is in the detail’ as the saying goes. Rather than just one element, it’s several design touches, some of them seemingly small, which give the kitchen its wow factor. Firstly the ‘Yin and Yang’ combination of materials and finishes – heavily grained shotblasted oak against super smooth, light painted furniture. Secondly, the correlation of the oak accent pieces with the home’s other architectural features such as the flooring and internal door treatment and thirdly, the attention to detail such as the subtle plinth lighting, which gives the impression that the furniture is floating. Don’t be afraid to challenge convention! It’s important the space works for you both in terms of content and planning as well as using finishes that appeal. There is no reason why you can’t combine traditional with contemporary – super smooth with heavily grained – or long and straight with beautiful curves. That’s the beauty of a true bespoke design and manufacturing service; the only limit is your imagination. Hayley loves: the attention to detail with the hand carved cabinetry and, of course, who could resist the personalised dog bowls.